Ascending Butterfly: Pass the Virtual #PurplePurse & a $5 donation will be made to YWCA for Dometic Violence Awareness Month + a #TwitterParty! Pass the Virtual #PurplePurse & a $5 donation will be made to YWCA for Dometic Violence Awareness Month + a #TwitterParty! You know how much Ascending Butterfly loves featuring Brands that Give Back. Brands and People that are working to make a difference in the lives of others will always have space here. In addition to October being Breast Cancer Awareness Month, it is also Domestic Violence Awareness Month, and this month The Allstate Foundation has chosen a Purple Purse as the symbol for domestic violence awareness, with the purse representing a woman's way to escape the cycle of abuse by gaining Financial Independence. The program, which is now in it's third year, has pledged to donate up to $350,000 to the YWCA for programs that are designed to assist survivors of domestic violence (and other women in need). To get the conversation going, 1,300 purple purses filled with information on domestic violence will be distributed across the United States with the goal of the purse being passed between family, friends, community leaders, celebrities, and media. In fact there is a twitter party tonight to raise awareness and I hope that you will join. While I am not personally co-hosting this one, I will be attending to help raise awareness and discuss this important topic. (and hopefully to win too!). 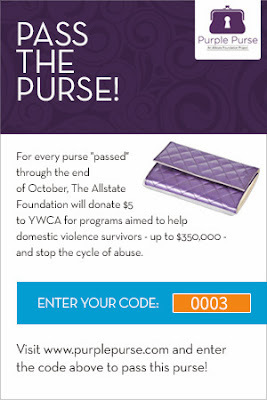 For every Purple Purse passed through the end of October, The Allstate Foundation will donate $5 to the YWCA, up to $350,000 to help domestic violence survivors and to stop the cycle of abuse! They are almost there, so I am passing my Virtual Purse to each and every one of you in hopes that you will share this information with your family and friends. If you see something, say something! If you suspect someone is the victim of domestic violence, let them know you are there to help, direct them to their nearest YWCA, they need to know that there are options out there, and they don't have to accept abuse, EVER! Butterflies, domestic violence occurs more than 145 times each HOUR in the U.S. on average, THREE women die every day as a result of injuries sustained and it affects one in four women in their lifetime - that is more women than breast, ovarian and lung cancer combined. Only about half of Americans know how to help the victims of domestic violence and the lack of financial knowledge and resources are the number one reason victims will return or stay in the abusive relationship. Let's all get on Twitter tonight and join the #PurplePurse Movement, this is a party that we must help 'trend' on twitter, let's get everyone talking about it! To be eligible to win you must be active during the Twitter Party and using the hashtag actively making an original tweet using the #PurplePurse hashtag and by answering party giveaway questions, winners will be announced throughout the hour. Again, I am NOT personally hosting or co-hosting, so please direct any questions directly to the hosts. I have registered my purse and passed the virtual code along to you, you can get involved by posting the code in the graphic above at www.purplepurse.com or via Facebook! Butterfly did you pass the purse? Three cheers to the Allstate Foundation , Latin Bloggers Connect, ascendingbutterfly.com and all those who are fighting this scorge !